Oh…it’s time for another fun challenge on Create with Connie and Mary! This week we have a fun and pretty simple sketch for you. Okay…so I have a funny story about my card. I wanted to do something a little different so I decided to do the ‘ornaments’ from the Your Presents set (LOVE this set AND it is the set I’ll be using for the Create with Connie and Mary October Mini Session! )…anyway, back to my story….so I decided to go with the ornament look then decided I would go with Real Read and Mint Macaron. So far…so good! I made my card and I have a habit of sitting it on my one table until I have a couple cards to photograph. It’s a table I walk by pretty frequently. Anyway…EVERY time I looked at the card…well…they look like TOMATOES to me and not ornaments! Then I thought…well, JOY would work for tomatoes too because if your tomatoes right now are looking nice and red like these are…that would be JOY! Mint Macaron Envelop dsp – 3 3/4 x 5, layer onto Whisper White 3 7/8 x 5 1/8. Stamp JOY in Real Red. Stamp ornament 3 times using Real Red, bow 3 times using Mint Macaron, and ornament top 3 times using Versamark and silver emboss. Punch out circles using 1 1/4″ Circle punch, cut out the other pieces and layer everything together. Next punch a 1/8″ hole in the top of the ornament holder (so you can thread your cord through). Add dimensionals to the back of each ornament. Wind Silver Cording Trim around panel, adding the ornaments as you go. Add the ornaments using the dimensionals you added above. Add Basic Rhinestones to the center of each bow to finish it off. This is my most favorite time of year as we are celebrating fall and getting ready for Christmas. 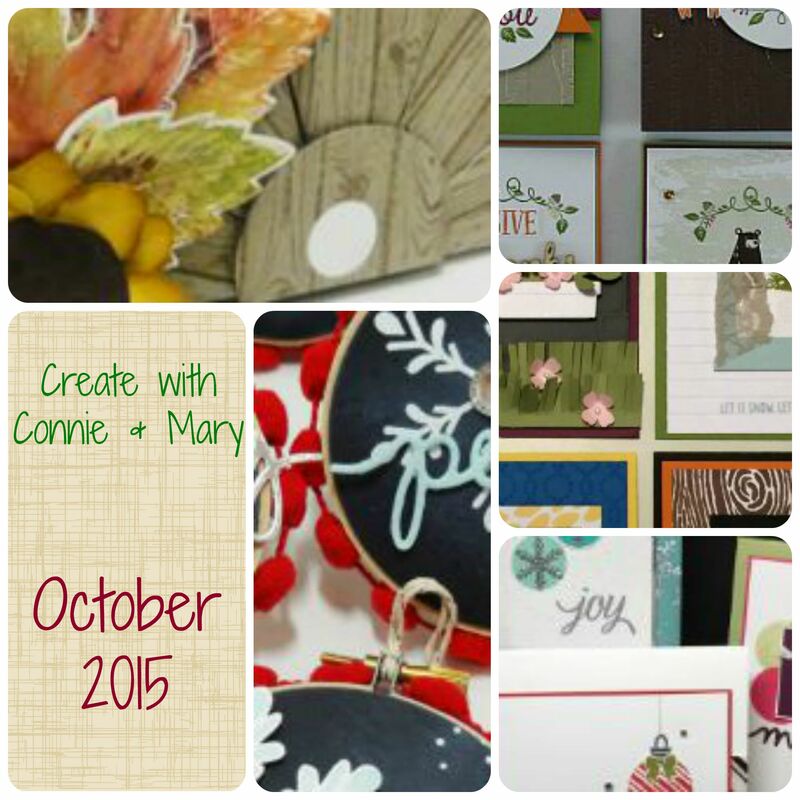 And the Create with Connie and Mary October Mini Session is all about that! 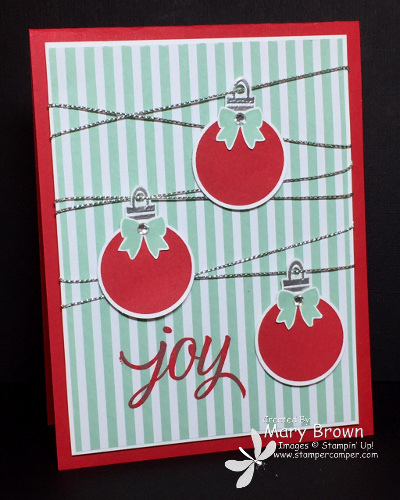 This entry was posted in Create with Connie and Mary, Holiday Mini and tagged Your Presents. Bookmark the permalink. What a great idea to use ornaments for this sketch! They are perfect hanging from the criss-cross cord! What a fun color combo too! I didn’t think of tomatoes at all until you said it! I see bright Christmas ornaments but you’re right, either way tomato or bulb, you can’t really go wrong! 😉 Very cute! LOL, Mary! Tomatoes!! I didn’t see them until you said that but nevertheless your card is so cute and I love the color scheme you used! I didn’t think tomatoes but I can see what you mean … or reindeer noses!! An unusual colour combination but one that works quite well – very crisp for those very modern ornaments. What a fresh color combination – and great idea to thread the ornaments onto the cord! Pretty! I think they look like ornaments but after you mentioned tomatoes, I can see that too! Either way, the card is adorable.